I've been working on an alternate timeline for MLB, and I think it's going pretty well. In the same vein, here's one on the NFL. Our POD is 1982....IRL, the Players' Association went on strike, hoping to get more money and richer contracts (so what else is new?). This forced the league to shorten the 1982-83 season to just nine games, and create a tournament for the right to play in Super Bowl XVII. In this alternate TL, the players never strike, and the full 16-game season is played. There are three divisions in each conference: the East, Central, and West. The three division winners (based on record) qualify for the playoffs, as well as three wild card teams (based on record). 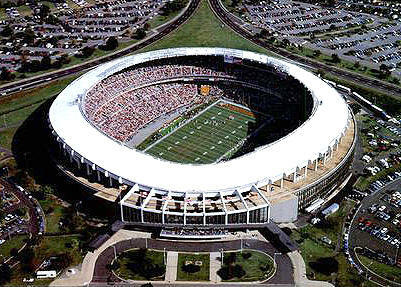 Home field advantage in the Super Bowl goes to the conference that calls that year's venue home. 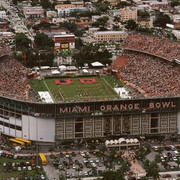 For example, if the Super Bowl was to be played in Miami, home field advantage would go to the AFC champion, since the Miami Dolphins are in the AFC. 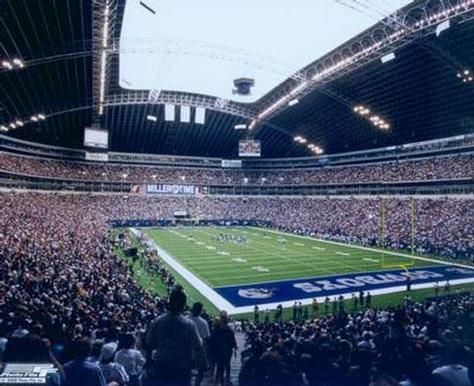 If the game was in Dallas, the NFC would have home field, since the Cowboys are NFC members. That being said, I hope you're "ready for some football"! The sixteen-week 1982-83 NFL regular season has been completed; twelve teams have been proven tough enough to advance to the playoffs. It's time for the post-season to get underway. In the AFC, it's been a banner year for the Los Angeles Raiders. They have managed to not only win the AFC West, but capture the AFC's top seed as well. 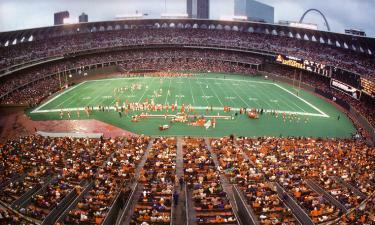 The Cincinnati Bengals, led by quarterback Ken Anderson, are another top contender, having gone 12-4. The AFC playoffs will start with two Wild Card Games. In the first contest, Dan Fouts and the San Diego Chargers will travel to Florida, where they will take on the Miami Dolphins. The second game will feature the "Gang Green" rushing attack of the New York Jets. Led by running back Freeman McNeil, they will enter the Steel City to do battle with Pittsburgh. Late in the fourth quarter, Lyle Blackwood of the Dolphins picks off Dan Fouts to give Miami a chance. However, several drops by the home team's receivers do the Dolphins in. At Three Rivers Stadium, Terry Bradshaw's bad day sends the Steelers packing for the golf course. Next up: AFC Divisional games. 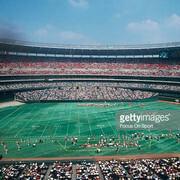 Just a couple of pictures of the home fields of AFC contenders. Almost forgot about this project. Here comes the next round of games (the NFC Wild Card round)! The NFC regular season has seen the Washington Redskins play some excellent football. 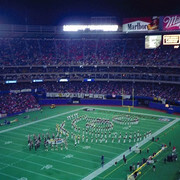 Led by all-pro quarterback Joe Theismann, the "Skins" have found themselves at the top of the NFC East, with a record of 14-2. In Wisconsin, the "Cheeseheads" are all smiles, as their Green Bay Packers are also top contenders. Green Bay finishes the season with a record of 13-2-1, which is good enough to capture the NFC Central division title. The NFC Wild Card Round will feature two outstanding matchups. You could say that the first of these is "for the birds"; the Atlanta Falcons will roll into Busch Stadium to do battle with the St. Louis Cardinals. In the second contest, Tommy Kramer looks to lead the Minnesota Vikings to victory against the Dallas Cowboys, "deep in the heart of Texas". DB Ken Greene of the Cardinals comes up with a big interception late in the fourth quarter, which leads the Cards to victory. At Texas Stadium, Minnesota has trouble holding on to the football; subsequently, the Vikings can't grasp an appearance in the Divisional Round. Next up: Divisional Round games. 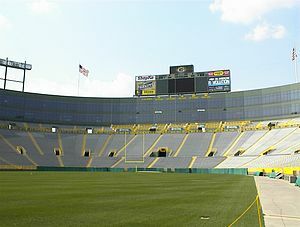 Pictures of a few of the NFC stadiums. The NFL Playoffs are in full swing, with two teams in each conference having advanced. Now, it's time for the Divisional Round. 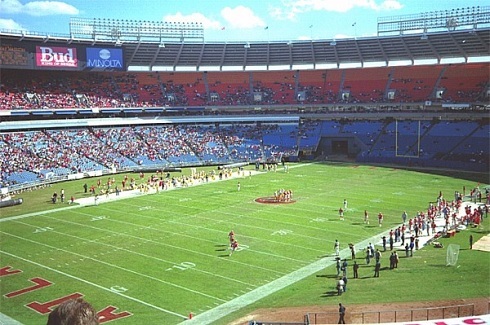 In the AFC, the San Diego Chargers have emerged victorious, having won a hard-fought game in Miami. The "Bolts" now must find a way to win again, as they face the Los Angeles Raiders in an all-California affair. Over in the NFC, the St. Louis Cardinals have managed to squeak into the Divisional Round. Can they repeat their success in Washington, and knock off the Redskins? Marcus Allen of Los Angeles has a great day with the football, leading the Raiders to an impressive win over San Diego. 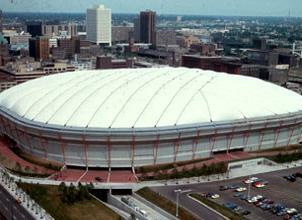 At Riverfront Stadium, the surprising Jets bring the heat on defense. Mark Gastineau and the "New York Sack Exchange" make life difficult for Ken Anderson and company, and New York gets the victory. Washington running back John Riggins runs all over the Cards' defense, helping the Redskins to advance. Home field advantage on the "Frozen Tundra" isn't enough at Lambeau Field; the Packers fall to the offensive attack of Tony Dorsett and the Cowboys.